The 30th Annual RGV Regional Spelling Bee took place Saturday, March 3, 2018, at Texas State Technical College in Harlingen. Veena Namboodiri, a student at South Texas Preparatory Academy in Edinburg was the top speller and will compete in the national Spelling Bee. HARLINGEN — “Transmittal,” said the pronouncer. 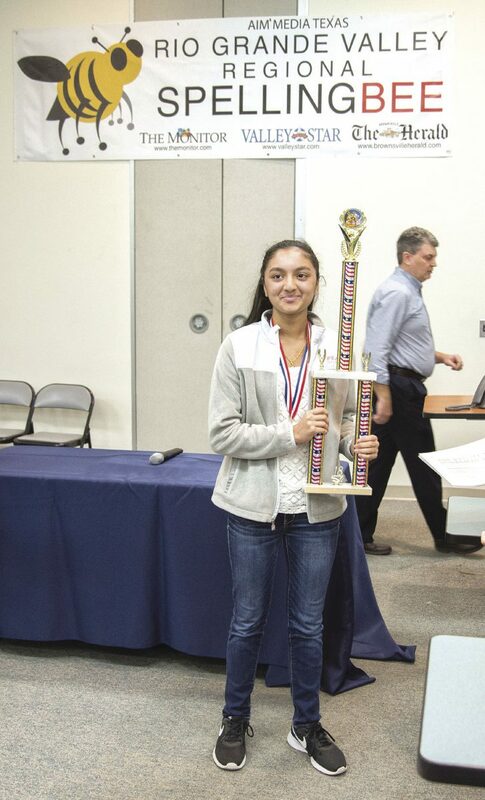 “Transmittal,” repeated Veena Namboodiri at the Rio Grande Valley 30th Annual Regional Spelling Bee on Saturday. She wrote imaginary letters across the table in front of her while judges and onlookers watched. “Can I have a definition?” she asked. 30th Annual RGV Regional Spelling Bee took place Saturday, March 3, 2018, at Texas State Technical College in Harlingen. Veena Namboodiri, a student at South Texas Preparatory Academy in Edinburg was the top speller. The 30th Annual RGV Regional Spelling Bee took place Saturday, March 3, 2018, at Texas State Technical College in Harlingen. Veena Namboodiri, a student at South Texas Preparatory Academy in Edinburg was the top speller. The judge, John Foreman, gave the definition. Namboodiri, 13, wrote the word on the table again, and then spelled it correctly into the microphone. “Woo!” several people shouted amid excited applause as Namboodiri, a McAllen resident and eighth grader at South Texas Preparatory Academy in Edinburg, was announced the winner after competing against 50 contestants from throughout the Valley. 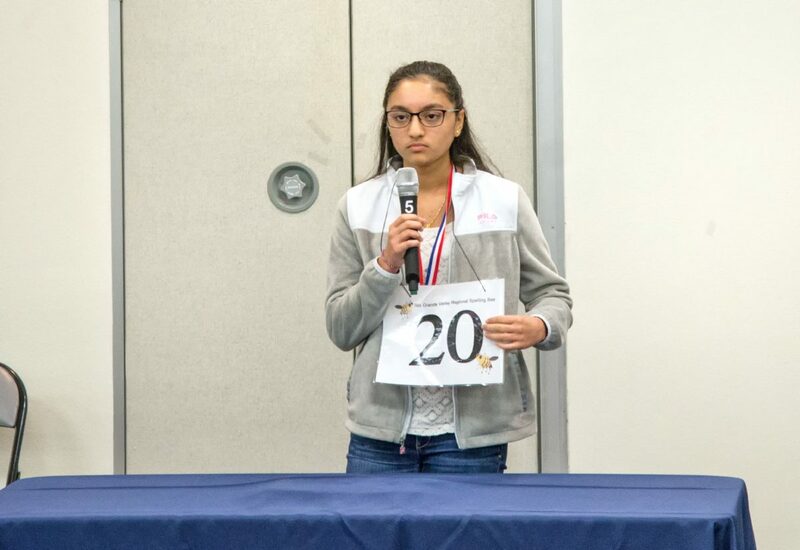 Her success at the event held on the Texas State Technical College campus earns her a plane ticket to compete in the Scripps National Spelling Bee in Washington, D.C., this summer. She was one step ahead of Stephanie Moreno, 13, the first runner up from Irene Garcia Middle School in La Joya. Hannah Garcia, 14, also of McAllen, was second runner up. Namboodiri recalled many long hours of practice. Namboodiri, like the other spellers, often asked the language of origin for their words, with good reason. “Italian has lots of double letters and things like that,” she said. Her father, Hari K. Namboodiri, expressed pride and admiration in his daughter. Garcia, the second runner up, is an eighth grader at Fossum Middle School in McAllen who has participated in spelling bees for years. Moreno, the first runner up, has been in spelling bees for years but she never made it to regionals — until now. This year she practiced long and hard, hoping to make it to Washington. Although disappointed, her efforts paid off in her not only making it to regionals but also coming in first runner up. She has good memories of competing in spelling bees over the years. “I got to meet new people in the Valley,” Moreno said. Her spelling coach, Elizabeth Villarreal, was very proud of her. 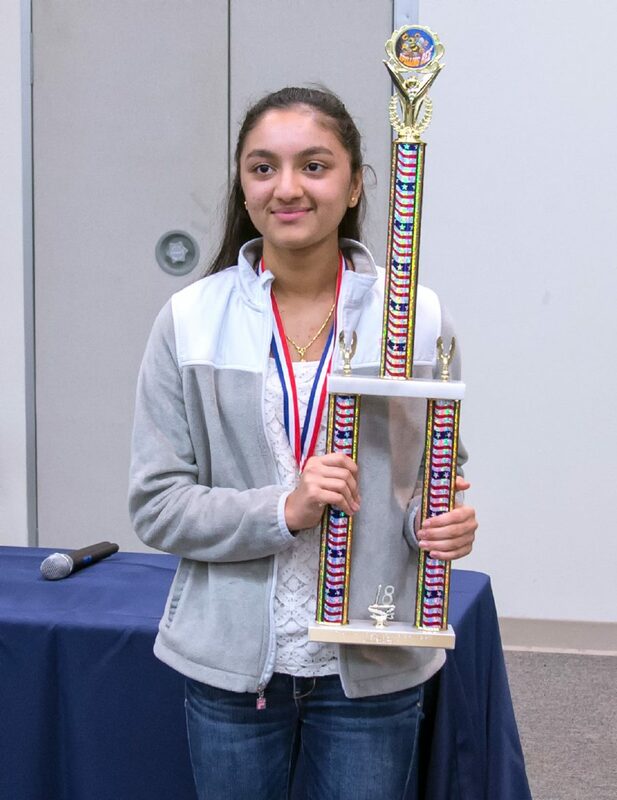 In addition to the trip to Washington to compete in the national bee, Namboodiri also received a trophy, the Samuel Louis Sugarman Award, a one-year subscription to Merriam-Webster Unabridged Online, and a one-year subscription to the Britannica Online Premium Edition.